It’s been a few years—and at least one bizarre, aborted crossover with the 21 Jump Street universe—since the Men In Black last showed up to save humanity from alien invasions/pesky memories of said invasions. F. Gary Gray’s attempt to get the franchise back on track—with Thor: Ragnarok stars Chris Hemsworth and Tessa Thompson starring in a new spin-off of the MIB franchise—seems to be progressing nicely, though, with Entertainment Weekly reporting that Liam Neeson might be about to sign on for the London-set project. 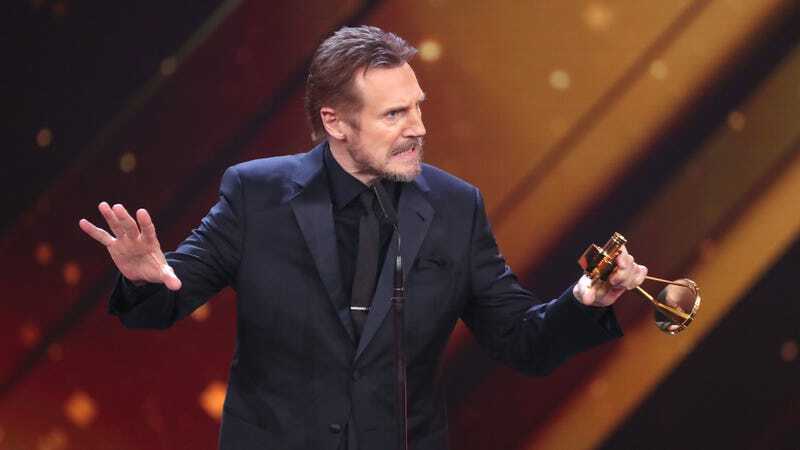 Neeson will apparently be playing the head of the secretive, occasionally-rapping organization’s British branch, a role analogous to ones played by Rip Torn and Emma Thompson in the franchise’s earlier installments. (Meanwhile, we have to assume, based off his recent cinematic M.O., that Neeson will erase people’s memories the old-fashioned way, i.e., by shooting them a bunch of times in the head.) The new Men In Black movie—which is expected to move on without any involvement from former stars Will Smith or Tommy Lee Jones—is currently aimed at a June 14, 2019 release date.